SmartWays offers retractable Awnings in different sizes, colors, elegant designs and shapes.Awnings that we manufacture provides perfect window solution. The materials used in the production of our exclusive collection of window awning are procured by using quality raw material using the latest technology. We ensure that our products are unmatched when it comes to quality of our products. These products are the best when it comes to sun and rain protection. 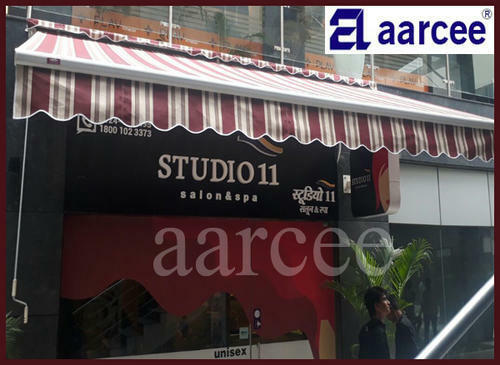 Established in the year 1990 at New Delhi, we, Aarcee, are a highly acclaimed Manufacturer, Wholesaler and Trader of highly qualitative Designer Wallpapers, Awnings and Canopies, Designer Floor, Window Blinds, Sun Control Films, Car Parking Shades and Customized Gazebo and Umbrellas. Our Awnings are manufactured using quality approved raw materials at our spacious infrastructure facility. These are available to clients in a wide range of styles and designs at budget friendly market prices. The products offered by us are highly acclaimed for their simple installation procedure, eye catching designs and durability. We provide these to clients within the specified period of time as per their requirements. We have put in place strict quality parameters in order to help ensure that clients get the best products from us at all times. Our commitment to ethics and quality has helped us become a highly sought after firm in the market. Our clientele comprises of residential apartments, commercial establishments and corporate houses.